I was talking to a fellow member of my school's robotics team, and we got to thinking that we should build ourselves a CNC mill to machine custom parts with. 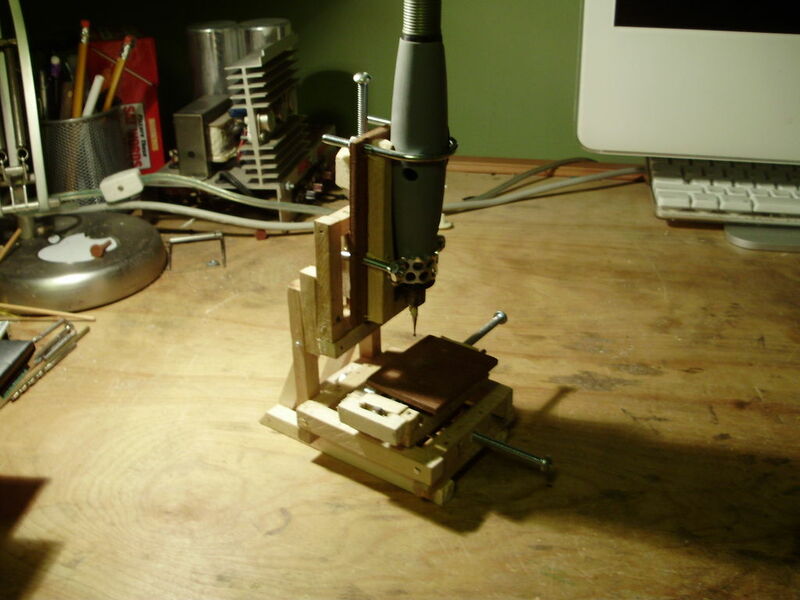 While doing some research, I came across and Instructable called "How to make a mini milling machine- manual or CNC!." The design of this particular machine is very good for a small scale milling machine, and I got to thinking I could scale it down even farther- much farther. This project is the result. Now that the Epilog contest has entered the voting phase, please remember to vote for me if you liked this project! It really does not take much in the way of materials to build this. Here are the tools and materials I used. 1/8" plywood. Mine is marine mahogany, because I have some scraps of it. In this mill design, the base of the mill contains the Y axis. To approximately match the length of the axles, I made the base 3.25" square. To make the rails for the platform to slide on, I drilled 4 holes through opposite sides so that the axles fit parallel to each other at the same height. All the joints are both nailed and glued in place. The next platform up contains the X axis. It is constructed similarly to the base, but with dimensions of 1.25" by 2.75", and the rails are raised up. On the base of this level, two sockets are fixed that slide on the rails of the base. The sockets are short segments of dowel which have been drilled out and have a piece of brass tubing in them. The platform is the part of the mill that whatever you are milling is fixed to. I estimated the range of motion of the mill, and cut a platform to the corresponding size out of mahogany plywood. Onto the bottom, I fixed sockets that slide on the rails of the second platform. The tower is the part of the mill that holds the motorized part of the mill (in this case a Dremel flex shaft) and contains the Z axis. This was once again built with square wooden dowels. Unfortunately, I ran out of stainless steel axles, so I used some thiner brass tubing instead. It is very important that the tower extends the right amount outwards, or the milling bit will not be able to cover all of the platform. With this design, the bit has to be a little in front of the center of the base. Step 6: Building the Tower, Cont. The next step is to build the part of the tower that will actually move up and down, and will hold the dremel. The base of this part is made up of more plywood. I added two segments of dowel down the middle and carved their corners out to fit the contours of the dremel attachment. On the back of the piece, I fitted two more sockets to slide on the rails of the tower. In order to make the platform and milling bit actually move, I had to add lots of threads. In the base of each moving part, between the two rails, I fixed a set of nuts that a long bolt fits through. If the bolt is held in place and turned, the platform moves forward or backward depending on the direction you turn the screw. The end of each bolt was fixed with a locknut and a piece of wood to stop it from moving. It is critical that the nuts are lined up perfectly perpendicular to the rails, or when the bolt passes through them it will not be parallel, which will cause problems when the platform moves. I mounted the Dremel attachment to the mill using "U" shaped bolts and some perforated aluminum. In order to not block the rails, the lower U bolt was bent at a 90 degree angle, and the threads protrude forwards instead of backwards like the first. I bent a piece of perforated aluminum to fit around the Dremel and hold it in place when bolted down. Mills tend to work better when they are fully assembled, so I had to find a way to sturdily fix the tower to the base of the mill. I started out by simply nailing and gluing it to the base, but this proved to be fairly flimsy, so I built a larger base and triangular supports for the tower. To actually use the mill, will need to mount whatever you are milling to the milling platform. I accomplished this with very small wood screws. Obviously, this will not work with any material more substantial with wood, but past that point the entire mill would probably break, so it is not really an issue. It is helpful to hang your dremel up above the mill while using it, so that the weight of the flex shaft does not tip the mill over. I have a loft bed, which makes hanging it above my desk very easy. If you have a practical use for this mill, be sure to let me know! My current plan is to put it to work carving designs into chocolate bars, but not much else has come to mind. You can see this project, along with others of mine, here as well. I really like that you were able to use basic materials you could find laying around the house to build an simple vertical mill. Anything can be purchased, but for the DIY project, your evolving efforts could lead to a very professional system while also learning a great many skills during development. I could see this as a 3/16" plywood kit that could be sold for educational purposes. From this you can build parts for a plastic-based milling machine. From the plastic based machine the parts for a metal-based machine can be built. From the metal-based machine the scaling up to a larger machine, and optional CNC machine can be constructed. Nice project. The discussion of a CNC mill at the beginning is a tad misleading. Just thought you might want to know that. nice build - will the next stage be to add stepper motors and connect to your PC?? I don't think so. As cool as that would be, I doubt I'd be able to do so with out doing some major modifications to parts of the design. Also, I don't know of any stepper controllers small enough for this project. use servo motors, they are small and strong, also easy to control them. Why does the controller have to be small? Use the guts from an old 3-in-one printer/scanner/fax for the steppers AND circuitry. There is a good "ible" for just this idea. There is an "ible" on making a desktop mill from plumbing. It also details a controller ripped out of a printer. The controller is about the size of a large cellphone. it uses the parallel port from a printer, but that's it. Poorly phrased it uses the COMPUTERS port and the controller chips from a printer. Anyway free parts and very small controller. The instructables I linked to never mentions the use of controller chips from a printer... and it is obviously not "ripped out of a printer" like you said, because he has pictures of the circuit board he etched himself. The CHIPS were ripped out of a printer. Nicely done! I like how you printed the fitting for it with the MakerBot. You (or your school) don't happen to be a part of FIRST, do you?